This week, Microsoft has been busy unrolling some new innovations for Project Managers and Big Data pros. It’s new 365 app, Planner was launched probably because they wanted their very own version of Trello or Asana, and its sure to be beneficial for companies and business groups already subscribing to 365. The Company also announced its Apache Spark v1.6.1 for Azure HDInsight is now “generally available,” just in time to talk all about it at Spark Summit this week. As a part of its Office 365 Suite, Microsoft adds Planner, a tool that allows Project Managers (or anyone with a 365 subscription) to keep track of workflows and organize and share project plans. “After creating a plan, users can create and assign tasks, share files and update their colleagues on the status of key to-dos,” (Blair Hanley Frank). A more casual approach to project management than the Company’s existing PM App, Project, it’s aim is to make business projects easier to manage for any groups that rely on online collaboration. The app’s integration with Outlook and OneNote allows for seamless communication of project steps between business units as well. Having recently merged our internal newsletter from Mailchimp to 365’s Sway, we’re excited to see how KellyMitchell can benefit from the new Planner app. Microsoft has been professing it’s love for Apache Spark for a while, and now it has essentially tattooed its name on its arm with the announcement that R Server for HDInsight in the cloud and R Server for Hadoop on-premises are now powered by Spark. 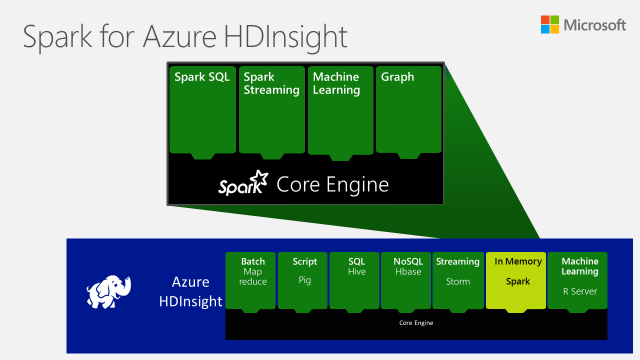 To take the commitment a step even further, Microsoft launched Apache Spark v1.6.1 for Azure HDInsight this week. Now that Microsoft has put all its eggs in Spark’s basket, we are excited to see how its big data and analytics services grow from here.